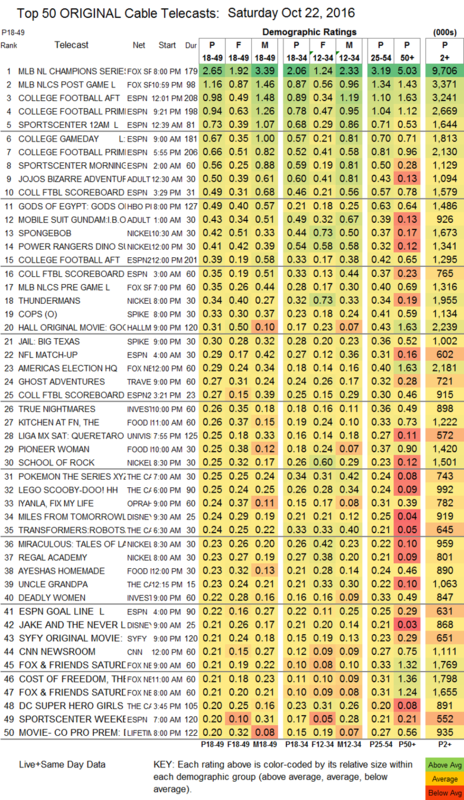 NETWORK FINALS: ABC’s COLLEGE FOOTBALL game adjusted to 1.8, and FOX’s to 0.7, up 0.1 for each of them. CABLE HIGHLIGHTS: Sports occupied 9 of the 10 top slots on Saturday cable, with Fox Sports 1’s coverage of the final Cubs vs. Dodgers BASEBALL PLAYOFFS game on top at 2.65. ESPN had a trio of COLLEGE FOOTBALL games in the Top 10, with Wisconsin vs. Iowa at 0.98, Ole Miss vs. LSU at 0.94, and Arkansas vs. Auburn at 0.66. Only Adult Swim crashed the party, and its late-night animation line-up scored as follows: DRAGON BALL Z up 0.09 to 0.66/1.423M, JOJO’S BIZARRE ADVENTURE down 0.02 to 0.50, MOBILE SUIT GUNDAM up 0.03 to 0.43, HUNTER X HUNTER up 0.04 to 0.42/887K, NARUTO up 0.06 to 0.41/643K, ONE PIECE up 0.08 to 0.38/761K, and ONE PUNCH MAN up 0.06 to 0.37/740K. Nickelodeon had 3 shows in the Top 20: SPONGEBOB down a tick to 0.42, POWER RANGERS up 0.13 to 0.41, and THUNDERMANS at 0.34. On Spike, COPS lost 0.02 to 0.33, and JAIL: BIG TEXAS rose 0.08 to 0.30. Hallmark’s original movie GOOD WITCH was at 0.31, Syfy’s SHADOWS OF THE DEAD was at 0.21, and Lifetime’s DEATH OF A VEGAS SHOWGIRL was at 0.20. On Food Network, KITCHEN AT FN rose 0.05 to 0.26, PIONEER WOMAN was up 0.03 to 0.25, and VALERIE’S HOME COOKING was up 0.04 to 0.18. BBCAmerica premiered DIRK GENTLY’S HOLISTIC DETECTIVE AGENCY at 0.12.